(Bloomberg) -- Deutsche Bank AG and Commerzbank AG are confronting a rising number of hurdles between them and a historic combination as unions vow to block the deal, regulators question its logic and lawmakers warn it may create more problems than it solves. With the banks edging closer to a decision on whether to create a German banking powerhouse, labor representatives are seeking to nix a merger and even push out Commerzbank Chief Executive Officer Martin Zielke to avoid job losses running into the tens of thousands. Regulators at the European Central Bank are casting a skeptical eye and lawmakers evoking the financial risks. And then there’s Deutsche Bank’s long suffering shareholders, who may balk at having to stump up billions in fresh capital to fund the deal. Opposition to a combination -- meant to guarantee a strong lender to the German economy in good times and bad -- is coming to a head while the banks themselves seek to iron out issues ranging from the premium Deutsche Bank should pay to who might lead the new entity. While Zielke is said to be keen to move forward quickly on discussions, Deutsche Bank CEO Christian Sewing is seeking more time to assess before a self-imposed deadline to update investors on April 26. Union resistance to the tie-up is becoming more strident and could be its biggest threat. Several labor representatives are so opposed to a deal that they are seeking an extraordinary board meeting at Commerzbank to shoot it down, people with knowledge of the matter said. No such meeting has yet been set, and there are still questions as to whether they have enough support to schedule a vote, they said. A spokeswoman for Commerzbank declined to comment on the plan for a meeting. The potential takeover has drawn heavy criticism from labor representatives at both banks. Zielke has thus far been unsuccessful in convincing Commerzbank staff that a merger may be a good option to increase market share quickly. He’s also emphasized that the outcome of the talks is open. “If there is no deal, then management may be pressured to present a new plan” for Deutsche Bank, analysts at Bank of America Merrill Lynch led by Andrew Stimpson wrote in a note. “One potential scenario could include another reduction” in the investment bank. Commerzbank gained 3.1 percent in Frankfurt trading Thursday and Deutsche Bank was up 2.9 percent. Support from employees is important not least because employee representatives hold half the seats on the supervisory board. Some labor officials at Commerzbank want to oust Zielke, German publication Manager Magazin reported, citing unidentified union-side officials. “Such allegations are irresponsible and unworthy of discussion," Stefan Schmittmann, chairman of the board, said by email. 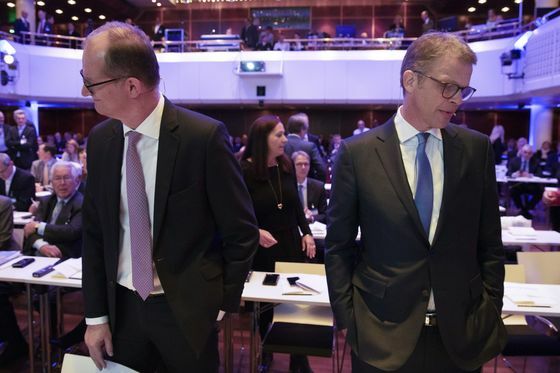 “I won’t shed a tear” if Zielke were to step down as CEO, Commerzbank supervisory board member and labor representative Stefan Wittmann said on the sidelines of an event in Berlin. Wittmann, employed by the Ver.di union, is one of the strongest voices opposing the tie-up. He coordinates his work closely with Ver.di’s main official on Deutsche Bank’s supervisory board, Jan Duscheck. Labor representatives on the boards of both banks are united in their opposition, he said. “We’ll review any deal proposal made by the management board but there’s only a minimal chance it’s going to be something we can approve,” said a spokesman for another labor union, DBV, which also has representatives on Deutsche Bank’s supervisory board. The two banks are also said to face intense skepticism from European regulators -- including several members of the ECB’s supervisory board -- over whether a combination would actually put them on a safer footing. Each has been grappling with restructuring and turnaround plans that have weakened their businesses and sapped their ability to generate revenue. ECB officials are also concerned their institution’s credibility could suffer if they approve the transaction and the combined entity later runs into trouble. Their decision is the biggest test to date for the ECB’s supervisory arm since it started overseeing lenders less than five years ago. Then there’s the rising chorus of opposition from some German lawmakers. The idea of a national banking champion is out of step with demands to further European financial integration, increases risks to Germany’s banking system, and could distract both banks from fending off fintech challenges, Green party lower house legislator Danyal Bayaz said in an interview with Bloomberg TV. The government -- perhaps mindful of the merger’s unpopularity in Germany -- has vowed to let the companies themselves decide before stepping in. The strongest support so far has come from the Finance Minister Olaf Scholz, who is said to have encouraged a deal behind the scenes, but now looks increasingly isolated. Even Social Democratic colleagues of Scholz, perhaps fearing the wrath of their traditional labor constituents, are questioning a potential takeover. A Deutsche Bank spokesman declined to comment on labor’s stance. It remains to be seen whether labor leaders can get any owners of the two banks to join them in trying to block the deal. Investor representatives on the two boards are still holding judgment until they see a detailed proposal, two people said. Qatari investors, though, are said to be unhappy at the prospect of having to pay up again. If an extraordinary meeting of the Commerzbank supervisory board is set, labor representatives would need two majority votes -- one to get a motion on the agenda about ending the talks, and another to adopt it, one of the people said. They could also try to keep the merger off the agenda for the annual general meeting of shareholders, currently scheduled for May 22, which could delay approval.